When a graph is displayed on your TI-84 Plus calculator, three options appear at the bottom of the screen. The Shades option redraws the graph shading only at the union or intersection of the regions. The graph in the third picture in the following figure is pretty cluttered, as is the case with most graphs of more than two inequalities. Press [ALPHA][Y=] or [ALPHA][WINDOW] to display the Shades menu. 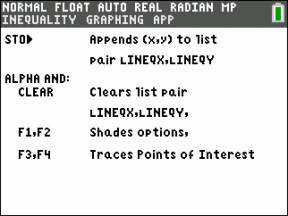 Because the Shades option at the bottom of the graph screen is above the F1 and F2 function keys on the calculator, pressing either [ALPHA][Y=] to select F1 or [ALPHA][WINDOW] to select F2 produces the Shades menu, as illustrated in the first screen. Use the right- and left-arrow keys to change the color spinner. Choose from 15 available colors. Press the number of the option you want. The new graph takes a little time to graph, but eventually appears on the screen, as illustrated in the second screen. After graphing the union or intersection of the regions in your graph, you can redisplay the original shading of the graph by selecting the third option in the Shades menu.